Greetings friends! This is a big moment for me, to finally reveal the full-on styled shoot I did with Cynthia Kain, which was published on Style Me Pretty Living last week! I've always been infatuated with styled shoots and secretly, since before our wedding, dreamed of curating my own. When I reached out to Cynthia for guidance on where to being/how to set something like this going, I was flabbergasted when she said she'd help make this dream a reality. My initial idea was a zumba bachelorette party, but Cynthia, being an avid Barre-goer, suggested it instead. She said Richmond Barre had a fabulous studio and her friends might allow us to shoot there. Once we got the OK from them, the pressure was on me to design the funniest barre bachelorette party possible. Naturally, I looked to Pinterest for inspiration and when I found these Meet me a the Barre t-shirts, the ideas snowballed. I worked with Sarah Rose on the invites. I wanted something fun, but clean and her design definitely delievered. Sarah also worked fast, which was a life-saver. PS: She's a fellow bee! (She's Mrs. Cheetah!) I printed and packaged the invites with the help of a very patient gentleman from Office Depot, and some creative girls at the Mosaic District Paper Source. My focus was healthy/fun/high-end and I think between the adorable swagbags and the Champagne toast finale, it's definitely all of those things. What do you think? I can't thank Cynthia enough for her guidance through this process, and for these amazing photos! I have to give props to the ladies of Richmond Barre as well. Their strength and fierocity for this sport is so amazing and inspiring. Barre is definitely not for sissy's, no matter how pretty and delicate it may look! And, thank you, Ghadeer (from Ask GG)! You are always so supportive, and this day was no different! I couldn't have done it without you there cheering me on and helping! 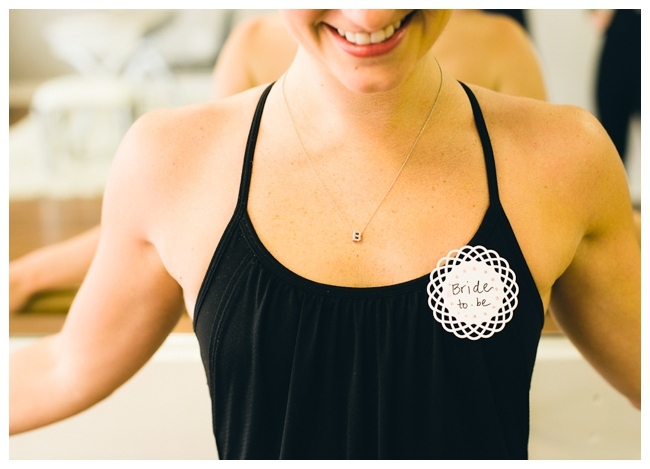 Would you consider planning a barre bachelorette party, or some other healthy alternative?